“Through my school years and elementary, I was always put in the back of the class and all the classmates knew. The teachers taught me that I was ‘different.’ So, all my classmates treated me like ‘different.’ The boys accepted me for who I was, but the girls did want nothing to do with me. I had a teacher who was very negative to me in grade 6. She told me I was not going to finish junior high school or become successful in life. When I started to go back to school, top grader in Alberta, every time I was frustrated, I remember what she said to me and I turned it into a positive energy for myself to continue on. So, you can always take the negative that has happened in your life and turn it into positive, so you can be successful. I married when I was 21 and moved to #Edmonton and decided ‘I want to go back to school,’ went to #Alberni Vocational College. I stepped in there on the grade 4 reading level, went from grade 4 to grade 10 in six months with the help that I needed and decided to enroll in the Nursing Aid program in 1995. I came third in my class, and worked in homecare for almost two years and then decided to move back to #PortAlberni, my home community. When I came back from Port Alberni, I decided that I wanted to get my B.C. ticket here, so I upgraded in North Island College. I got a B- in grade 10. I had some personal issues. I was half-way in the class and I had to leave. About three years ago, I started working with Cindy (Case Manager at #INEO Employment Services) again and I came to the conclusion that I wanted to finish my dream off and become an HA worker. I’ve been tested multiple times my learning disability and they told me that I had Attention Disorder as well, so it’s easier for me to do it at home in a quiet space where my child was next door and I had #NorthIslandCollege from #Ucluelet. I also was tested through INEO again which helped me to get to the bottom of my disability. 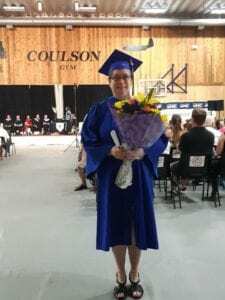 Then, when I came back to Port Alberni, two years ago, from living in #Alberta again with my new family, I decided that I wanted to finish the course that I started in 2000. So, I studied my grade 11 #English and wrote the test and got accepted. (…) I was called in. I was rushed to INEO and stressed out to the max trying to get the things sorted out as I got started. So, the first month was really tough and hard to get back into the school system. I then decided to seek Pat Mann who taught me in 2000, My heart goes out to her and I will never forget her help. Now, I finished my course. I have a job with #PAACL (Port Alberni Association for Community Living) in Port and recently going for a couple of job interviews in the mental health field. I’ve been very grateful to be part of the INEO system and being employed by them. I’m continuing my education and I’m not going to stop learning. I want to motivate other people. Whatever your dreams are, they can come to reality with help from others and help from yourself, your inner self, your self-esteem and your self-worth. You can be successful in life and I hope this helps everybody else to motivate themselves as well.